Many people know that the most important events in the history of humankind are presented in many films and books. 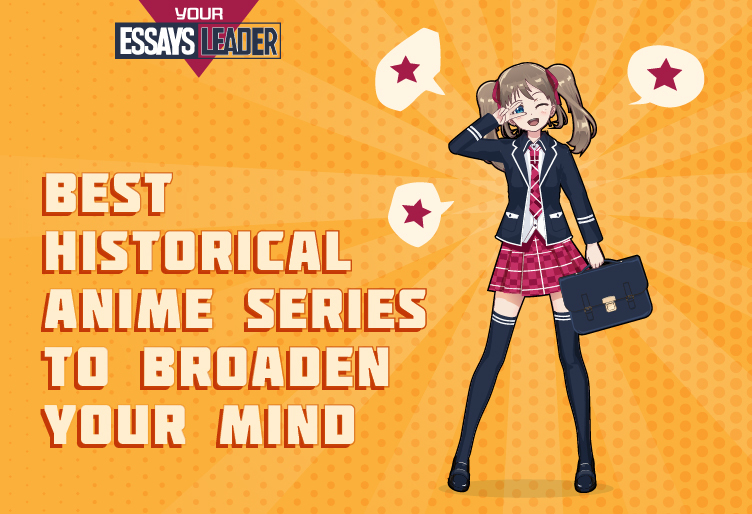 However, not all cinephiles know that there are anime series on historical subjects. Here is the historical anime list that will interest even the most demanding film critics. This cartoon series represents the USA in the 20s of the 20th century. New York is the center of the main action. Cartoon makers were able to recreate the atmosphere of that time. You will see gangsters, exquisite ladies, retro cars, casinos, gangster clashes and much more interesting things in this anime. The mystical name of this anime immediately prompts the audience to the idea that the action takes place in London. The cartoon depicts the period of the Victorian era. One of the main characters of the anime has his own business for the production of toys and lives a normal life. However, once he learns that his butler is a demon who is called upon to protect his house by any means. Do not expect to see the exact reproduction of the atmosphere of the Victorian era in this series. For example, the main character has a chainsaw, which is not consistent with the period presented in the anime. This anime tells the story of the Japan-Vietnam War. The main character is a teenage girl who at first glance is no different from her peers. However, in fact, she is a vampire and a spy. The cartoon shows a lot of cruel and bloody scenes. This is a kind of mixture of horror and fiction. The king of the northern lands of Van refuses to submit to the will of the Gods, thereby incurring their anger on his people. Wu Gen is the son of the rebel king. Wang comes to the aid of his old friend and rival Qi Yu, the legendary sword master. If King Van fights for his people, seeking to overthrow the gods, then the swordsman fights only to protect the queen with whom he is in love. Anime actions take place in Tokyo, Japan. The girl meets a mysterious man who gives her a pocket watch. They look unusual, but behave even more strangely – they always show one direction, as if pointing the way somewhere. As a result, the girl comes to the temple of Toria. Suddenly the temple transfers her from the present to the period of Bakumatsu. Being in an era where values ​​are completely different from the values ​​of her time, she wants to go back to her home as soon as possible. Born in an imperial family, Chu Yuan weighs in every step, fearing to lose everything because of his own negligence. He ascended to the throne at the age of eighteen, and six months later, civil unrest began in Yunnan Province. Although not all the courtiers showed unanimity, they waited for the new emperor to cope with this situation. The emperor had not yet managed to undertake anything. Duan Bai Yue led the troops to quell the rebellion. In the dim light of the moon, Chu Yuan put a wax seal on a secret letter and sent it over 800 miles to Yunnan. The pen pressed so hard on the paper that the outlines of the letters were visible on the back. One could understand how angry the young emperor was when he was writing those lines. Young Ye Xing Yun, after the departure of his teacher, becomes the new leader of the great Tianyuan clan. New opportunities force Ye Xing Yun to step on a dangerous path, but tactics, strategic thinking and the help of experts are excellent tools for solving problems and revenge. Toyotomi Hideyoshi is about to unite the provinces into one state. He wants to capture the castle of Odovar, which is defended by Udziyasu Hojo, known as “Leo Sagami.” Generals trained by Hideyoshi himself (Ishida Mitsunari, Kato Kiyomasa, Fukushima Masanori, Ootani Yitsitsugi, Sima Sakon and Nao Kantsugu) participate in the battle. Among the warriors, there are two people, for whom the capture of the castle is of particular importance. These are brothers Nobuyuki and Yukimura from the Sanada clan. Yukimura bravely rushes into the thick of battle. His brother does not lag behind. China, 1931. The KMT with the support of the United States seized power and moved the capital to Nanjing. The Communists and a number of military leaders do not agree with this alignment; a sluggish civil war is raging in the country; the strangest unions and alliances appear and die. Japan, of course, could not stay away from these events, but the difficult situation in the Yamato land precluded direct intervention. Therefore, the Japanese authorities entrusted the actions in Shanghai to unofficial structures, including the secret organization Sakurai. The combat part of the organization consists of four agents with unique abilities: a telepath and aristocrat Yukina, who came to China in search of her older brother, her servant Natsume, who possesses super-sharp vision, a hereditary samurai Kazura, who owns the gift of teleportation, and telekinetic Aoy. These fighters of the invisible front “solve questions” day after day in favor of the Land of the Rising Sun. London is divided into the east and west by a large wall. The girls serve as secret spies, enrolled in queen Mayfair’s prestigious school. Girls use their individual abilities to remain active in the underworld of disguise, espionage, penetration and car chases. The action of the “Rose of Versailles” takes place in the second half of the 18th century in pre-revolutionary France. General de Jaré has no heir. The desire to raise a son who will continue his paternal military career turns out to be so strong that the general calls his last daughter Oscar-Francois and raises him as a boy. When Oscar turns 14, her father presents her to the king – not as a shy debutant, but as a contender for the title of the commander of the Queen’s personal guard. Oscar achieves this high rank and becomes the bodyguard of the young Marie-Antoinette. Japan, 1955. The quiet town of Hofu is surrounded by rice fields; life flows slowly and steadily. However, the 9-year-old Cinco Aoki, the leader of the local children, never feels bored. After all, there are so many mysterious and interesting things around! She learned that once their city was the capital of Suo, from where it was within easy reach of Kyoto, the ancient imperial capital, by the Inland Sea. A thousand years ago, the daughter of the governor lived in a house by the sea. The anime tells about the world of childhood, which is so pure, naive and simple, and which has no boundaries. You can make friends with a strange visitor from Tokyo and with a princess from the distant past. Everything is possible, as long as there is the strength of the spirit and imagination. Cinco and her friends touch this thousand-year magic. Watch this good historical anime to plunge into the atmosphere of a miracle. Paris, the last quarter of the 19th century. Wars and revolutions have died down for a long time; the barricades of the Commune remained in the recent past. France is still a world power, and its capital is the center of European culture. Oscar Claudel is a merchant and traveler. He brought a young girl Yune from Japan, and she began working in his store. Very soon, Yune settled into a new house and began to bring benefits, not only helping with the housework but also attracting visitors with her exotic look. The young master gradually learns to appreciate the young assistant, who, as it turns out, understands much more than he says. As always, problems are not at all in the language gap, problems are usually in our heads, in honesty with ourselves and with each other. Hey there, my name is Mr. Robin Essay, I'm EssaysLeader partner and assistant! I'll be here in blog in case you need any academic help!